- A High activity product with low profile flat-lock stitched seamsfor a comfortable slim fit wear. - Quick Drying fabric with anti-bacterial properties. - Designed for high activity sports or outdoor use. The BODY SHOCK Quick Dry T-shirt is not just another compression shirt. The shirt was designed for the sole purpose to keep operational soldiers cool, dry and comfortable under the highest of stress conditions. Tried and tested on the field of battle the BODY SHOCK is battlefield proven to keep the user at optimum fighting condition. The BODY SHOCK Quick Dry T-Shirt is made of lightweight fabrics which are produced according to the latest technologies allowing the BODY SHOCK to be extremely comfortable through its advanced breathable properties. The Dry Cool wear properties make the BODY SHOCK extremely functional for use in battlefields and other extreme physical exhertions under hot circumstances, ensuring optimum and stable temperature control for the user. 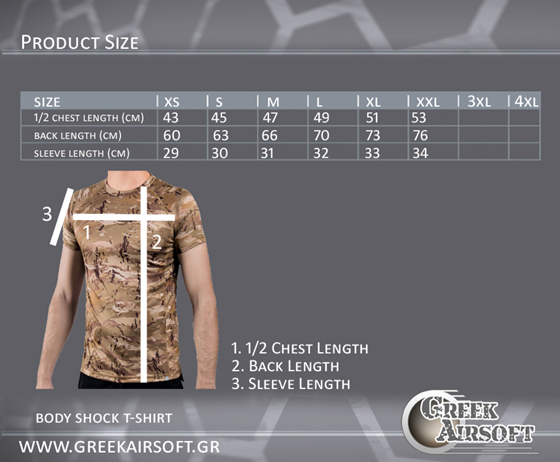 With the BODY SHOCK Quick Dry T-Shirt you have the maximum movement freedom under all conditions.